The Detroit Red Wings ended the Stanley Cup dreams of the Chicago Black Hawks last night. 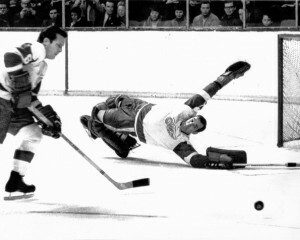 The Red Wings scored a thrilling come-from-behind victory over the Black Hawks with a 3-2 win at the Olympia in Detroit. Dean Prentice, a late-season acquisition from the Boston Bruins, made Detroit general manager-coach Sid Abel look like a genius. Prentice scored two third-period goals to erase a 2-1 Chicago lead and provide the Wings’ margin of victory. No doubt how Dean Prentice felt after scoring the winning goal. Prentice’s scores came in the last four minutes of the third period, giving fans one of the most dramatic series finishes in a long time. Not to be forgotten on the Detroit honour roll is goaltender Roger Crozier. The little left-handed netminder was solid throughout the series, but saved his best magic for the closing moments of the game. The Black Hawks, desperately trying to avoid elimination, threw everything they had at the Wings and Crozier in the final couple of minutes. His best saves were on Ken Wharram, Bobby Hull and Pat Stapleton. He had made an earlier crucial save on Stan Mikita, who cut around the Detroit defense and broke in alone just before Prentice’s game-winner. The Red Wings opened the scoring just before the three-minute mark of the initial frame. Andy Bathgate scored his fifth goal of the playoffs from a scramble in front of Chicago goalie Glenn Hall. Bathgate now leads all playoff scorers in goals. The second period belonged to Chicago. 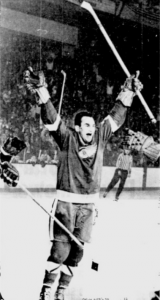 Phil Esposito and Stapleton scored the session’s only two markers and might have had more had it not been for Crozier’s work between the pipes for the Wings. The final 20 minutes were tense and close-checking, with Chicago determined to not let this one get away. And it looked for most of the third that was going to be the case. 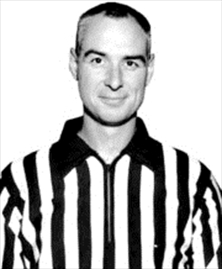 Glenn Hall was brilliant in the Chicago goal and the Hawks’ rearguards were hitting everything that wore red. 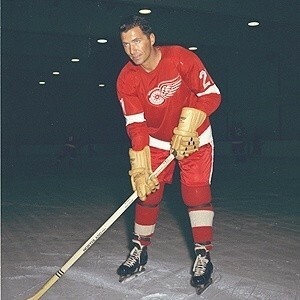 Roger Crozier was brilliant for the Red Wings. Then, at 16:25, and just after Crozier had thwarted Hawks’ Eric Nesterenko with a spectacular stop, Prentice converted an Alex Delvecchio pass out from the corner and suddenly the game was tied at 2-2. The Detroit fans went into a frenzy, sensing a comeback and a possible series win. They littered the ice with programs and other debris, delaying the game for five minutes. The recess in play enabled Abel to leave the Prentice-Delvecchio-Howe line out for an extra shift and the strategy paid off. Just over a minute later, Delvecchio sent Prentice in alone and he beat Hall from close in with a perfect shot. Another of Abel’s deals during the season paid off as well last night. Rearguard Leo Boivin, who came from Boston along with Prentice as a replacement for injured Doug Barkley, was at his bodychecking best. He nailed several Chicago forwards as they executed forays into the Detroit zone. 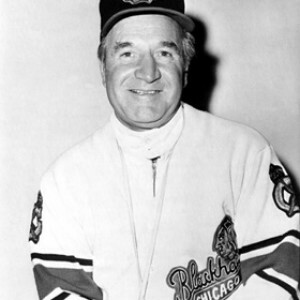 His first-period hits on Stan Mikita and Doug Mohns certainly caused the Hawks to exercise considerable caution when they advanced on the Detroit goal. “I was lucky. The back healed perfectly and then the Bruins traded me here. This team is the greatest and those two guys I play with (Howe and Delvecchio) are the greatest. I hope I can repay them (the Wings) some more in the next series. 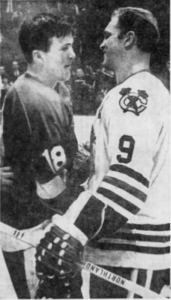 Bryan Watson, Bobby Hull shake hands after bitterly-fought series. Home for Hull is his farm at Pointe Anne, Ontario. Chicago coach Billy Reay wasn’t happy with Watson’s tactics. “You can’t object to a player skating with Hull and bodying him. That’s just good defensive hockey. But what this guy did was rotten. He used his stick on Bobby and grabbed him every time they came close together. “He did everything. Interference, holding, cross checking. You can’t sell that kind of stuff to the public. The NHL won’t put anybody in their seats with that type of thing. Referee John Ashley sent the pair off together three times. “He (Watson) did a good job. That complicated matters for them. But I don’t know what Chicago expected us to do – leave Hull alone? The Red Wings will now get a much-needed rest. They begin the Stanley Cup final series Sunday afternoon in Montreal against the Canadiens. Detroit was a decided underdog going into this series and will occupy the same position against Canadiens. Montreal is listed as an early 3-1 favourite against the Detroiters. 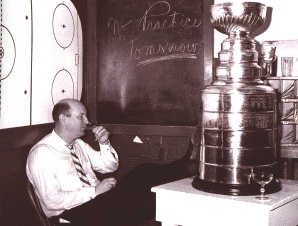 Punch Imlach, in happier times, will guide the Leafs for four more years. You can forget about those rumours claiming that Punch Imlach would leave his coach-general manager post with the Toronto Maple Leafs. 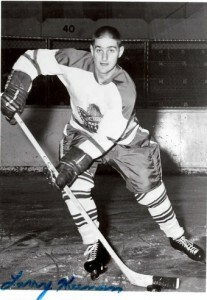 Imlach yesterday signed a new contract with the Leafs that will keep him in Toronto for another four years. Reports had been circulating that Imlach was all but signed, sealed and delivered to the new Los Angeles expansion franchise owned by former Torontonian Jack Kent Cooke. Yesterday’s signing put an end to that. Imlach will be paying close attention to players like Victoria’s Larry Keenan. “I signed as general manager-coach on very satisfactory terms. This should put an end to the wild tales that I was (a) leaving town and (b) that I was retiring to the front office and someone else was taking over as coach. “Now that my personal future is settled I can get on with the business of planning for next season. I am leaving for Tulsa today to watch our team there play Oklahoma in the Central Hockey League finals and from there I’ll go to San Francisco to see our Victoria Team in the Western Hockey League playoffs. How long I stay on the coast depends on how well our teams do.